Lucy took up the oboe at the age of 14, having first learned the piano and the bagpipes. She went on to complete a Bachelor of Music in oboe performance at the Auckland Conservatorium of Music and then spent a year with the Auckland Regional Orchestra before moving to Sydney, where she studied with Guy Henderson. She became a full time musician with the NSW Police Concert Band as well as freelancing in many professional orchestral and chamber music ensembles in and around Sydney. She also taught the oboe both privately and as part of a primary school band programme. Since moving to Nelson in 2012, Lucy has enjoyed playing with the Nelson Symphony Orchestra and has performed with them as soloist. Lucy is happy to teach upper primary students from around 11 years of age and onwards. The oboe is generally not suitable for younger students due to it being physically strenuous, however a good pathway can be learning another instrument for a couple of years and then switching to the oboe. 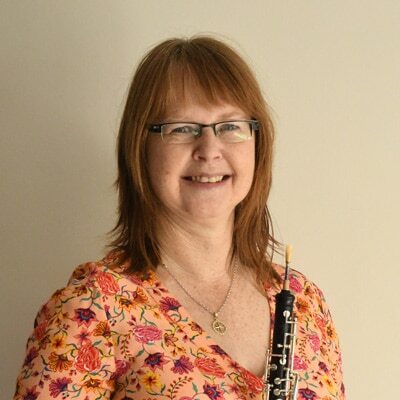 First and foremost Lucy believes in providing a kind and supportive environment so that learning the oboe is fun and lessons enjoyable. She also believes that learning technique, including scales and studies is just as important as playing pieces. Lucy is happy to prepare students for exams, incorporating aural tests and theory along the way.